It's not exactly surprising but it's always visually incredible how you can paint the world with data. Like this lovely map visualization. 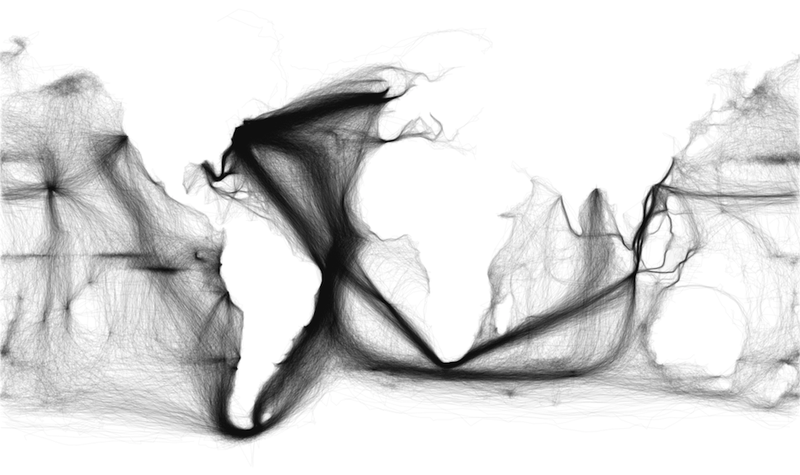 You can see the outline of continents take shape from just charting 19th century ship patterns. There are voids in the map, of course, but it's impressively clear in so many parts too. The map, relayed from Maps on the Web, is a result of Ben Schmidt's fascinating study of the data of oceanographer Matthew Fontaine Maury of the US Navy. There are millions of data points at work here and they all team wonderfully well together. Schmidt considers how to do humanistic readings of digital data in his piece but I'm just excited for the future version of the map where we can paint our entire galaxy by tracking spaceships.